As a mom, I deal with tons of odors on a daily basis. Everything from dirty diapers to spit up and smelly feet! Life is sure interesting with babies! I think the worst smell is when I change a dirty diaper after baby has finished his "business" and it has taken him a while. You know...when the odor just lingers in the air for hours afterwards? It isn't fun. I can't tell you the times that I walked through my house with an air freshener can spraying it over my shoulder. Whew...like I said, being a mom is TOUGH! Well, today I have a company that offers a really nice product for those of us who have our noses in stinky business throughout our day! PureAyre offers multiple types of odor eliminator sprays that are comprised of plant-derived enzymes, purified water and essential oils. When I use traditional air fresheners, my house smells like I just sprayed chemicals in the air. PureAyre is NOT a chemical which makes it stand out from all other sprays. One thing about PureAyre that I love is that it eliminates EVERY odor. Skunk spray, rotten eggs, ammonia, gasoline, etc. There have been products that claim to do that but I have yet to find one that actually does. So you can imagine my excitement to try out PureAyre. For this review, I was sent two bottles of PureAyre Odor Eliminator for Baby. I had the opportunity to use this spray within hours of receiving it. :) My 2 1/2 year old has yet to learn how to poo poo in her potty...thus messing her undies. Sure enough she filled her training pants and I got busy changing her. After I was done, the whole house reeked. So, I got out my PureAyre and sprayed all my rooms. The smell is pleasant and reminded me of a vinegar odor with a slight hint of mint. 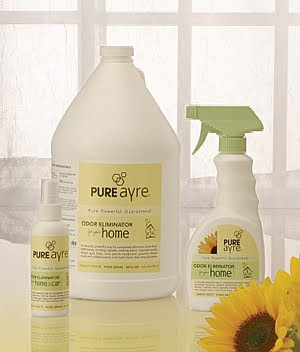 When I was done spraying my PureAyre, the house smelled great and it took seconds to eliminate the odor. I notice that when I use other air fresheners they take awhile to work. PureAyre works instantly! YAAY! What I loved most about this Baby Odor Eliminator is the fact that it can be used on just about anything baby-related. It eliminates (not covers up!) odors around diaper pails, strollers and car seats and it can be used as a stain remover as well!! I love the versatility. Along with the PureAyre Baby Odor Eliminator, you can also buy PureAyre Odor Eliminators for your boat, home, pets and dogs. So, in my opinion...PureAyre is a fantastic company! Rather than fill the air in my home with chemicals, I prefer using this product. It works instantly and smells great, leaving my rooms fresh and odor-free! I highly recommend the PureAyre Baby Odor Eliminator to any parent who is frustrated with constant and lingering odors they deal with on a daily basis. Visit PureAyre and tell me which of their products you would love to try. You do not have to be a blogger to enter, but you must have a valid email where you can be reached should you win. If you do not leave an email address, it must be where I can easily find it. This giveaway is open to US residents and will end 5/2 at 11:59 pm EST. The winner will be chosen using random.org and will be notified by email. The winner will have 48 hours to respond, or another winner will be selected. 1. Follow me on GFC. 1 entry. Disclaimer: I received no monetary compensation for this post. I received PureAyre Products for review purposes. All quotes are from the PureAyre Website. All thought and opinions are 100% mine. The PureAyre for the home would be best for me. With the baby in the house I would be interested in trying the baby odor eliminator. I'd love to try the marine formula - not that I have a boat (yet!) but I could use it on our sporting gear! Thanks for the chance to win. I've subscribed to your blog. Entry 1. I've subscribed to your blog. Entry 2.
i'd also like to try the odeor eliminator for pets. i would like the pureayre for home or baby! I would love to have this for my camper. I follow on GFC. I would like to try either Marine or Home Pure Ayre. I would use the regular home use product. Sadly my baby days are over and my cats are good girls about using their little box. I would love to try the Pet Refresher and Odor Eliminator For All Dogs and also the Odor Eliminator for Baby. Really I want to try them all! I want it for pets and baby! I would like to try Odor Eliminator For All Dogs. I "Like" PureAyre on Facebook. 1. I Subscribed & confirmed my subscription to your blog via email. 2. I Subscribed & confirmed my subscription to your blog via email. I would like the For Home version. I would love to try PureAyre for All Pets. Also following PureAyre on twitter as ky2here1. Like PureAyre FB as kyhere here. would love to try their odor eliminator for dogs - 6 lbs of dog can get pretty stinky! PureAyre Marine Odor Eliminator looks very interesting! I tweeted about this giveaway at http://twitter.com/likwan/status/65242370828013568. I follow PureAyre on Facebook under the username likwan. I follow PureAyre on Twitter under the username likwan.